This website has shown many reasons as to why any right-minded Prisoner fan should stay away from Six of One. So how do they still attract members in 2015 (albeit in dwindling numbers)? Obviously, they do not announce their many shortcomings, as one would expect, and many potential members are in the dark with regards to the Society. What they do in addition to this, however, is just as concerning. The Society openly lie about what members of the Society will receive! No Six of One Roadshow events have taken place since the mid-1980s. "For all of the latest detailed Prisoner news, (not just the brief items mentioned here), "
As is proved HERE, there are many merchandise items which Six of One ignore. "There are many local groups within Six of One in Britain." There are very few active local groups advertised within the Society. There are many local groups OUTSIDE of the Society, however. Click HERE for details. "We have access to the largest archive of material on the series and we share this information with our members." In their Society terms and conditions, the Society claim to not own any property. Click HERE for more on this. "We celebrate the society's birthday every January, and this often coincides with a major event at which members have the opportunity to meet people who actually worked on the series"
No January events have been held within Six of One since the 1990s. No Prisoner guest has attended an anniversary event since 1997. In 2002 (the 25th anniversary of the Society, and 35th anniversary of The Prisoner), no celebratory events were held at any point during the year. ".....we publish a professional, high quality magazine which contains many photographs both from the series and taken during production." As is shown HERE, magazine output is at an all-time low. ".......every nook and cranny is taken up with undiluted "Prisoner" matters". The magazine is filled out with self-referential nonsense, "meet the coordinators" features and 5 page poems. "We are also involved with every major Prisoner-related project and keep our members informed." Another lie. Members are kept in the dark regarding Prisoner news. Click HERE for details of their lack of promotion of the BFI Patrick McGoohan celebrations, Official DeAgostini magazine and DVD, the Prisoner script books, Prisoner novels, Patrick McGoohan biography, Official quiz book, Patrick McGoohan interview CD and many more items in which Six of One were not involved. 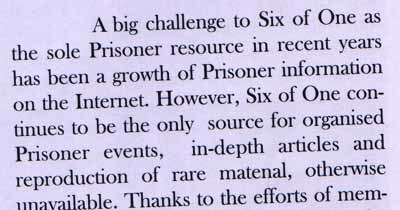 "A magazine written by the most knowledgeable Prisoner authorities on earth - the members of Six of One." All the members who had any knowledge or talent have left the Society. "Six of One’s membership has always exceeded 1000 in each year, with the highest figure recorded 20 years ago, at over 3000. The current subscription year runs from about mid-April 2005, through to the same time in April 2006. The membership size from the start of the renewal period is over 500 and in subsequent months, with new members joining, the society grows to 1000." In 2015 the claims of 1000+ members no longer appear on the websites. In 2014 in a magazine interview with a coordinator at the Festival Number Six event which some Six of One members attended, it states that "the figure is nearer 300". "Here's a quote from Dave Rogers, author and expert on "The Avengers" TV series... "If all of this sounds too good to be true, or strikes you as being far-removed from the average "fan" organization, it is hardly surprising. Take it from one who knows, there is nothing average about Six of One. Since its inception, the society has signposted the path for others to follow." - from his book "The Prisoner & Danger Man". A glowing reference indeed. A shame that this quote about the Society is from 1989 (from a time when the Society was world-renowned and didn't spend it's time conducting immoral and illegal activities). American members are also "bribed" into joining with the promise of extra items (including items which are FREE from Portmeirion anyway), even though the Society terms and conditions state that "The society operates a non-discriminatory policy in all ways and intends fairness and openness in its dealings". Rather unfair that US and Canadian members are offered extra items, and the rest of the World not. ".......visit "those famous double doors" in the Hyde Park car park"
As the "famous double doors" were demolished several years before, it as wondered how the Society could make such a claim. Even after the event, their websites claimed these doors had been visited that weekend! "Our Convention has an extremely packed, and very full schedule of programs. With many never-seen-before items and reenactments. We have received over 200 registrations to date, and because of an overwhelming demand, all of the accommodations inside The Village are booked"
Totally misleading statement. Firstly, from mid-February onwards until early March phone calls confirmed that there was a variety of Village-based accomodation still available. *Not* sold out as Six of One's website states. Also, the "200 registrations" infers that 200 people have registered (thus giving the impression that the event is popular, and not to be missed). It is worth mentioning that one person attending the entire weekend has to register, via a registration form, 3 times (once for each day). 210 registrations therefore equals only 70 people. "Over the past twenty years, more than 50,000 individuals have been members of The Prisoner Appreciation Society." "Your privacy is important to us". Try telling that to Dave Healey, who was secretly tape-recorded by Six of One in his own home. The above statement can be found in the Society's Terms and Conditions - a particularly frightening (and misleading) set of rules which members must read and adhere to. Bruce Clark (a particularly abusive and unhelpful coordinator) also feels it necessary to make false claims on his website with regards to the Society's ability to find out exclusive information. At one point, The Unmutual website announced news of a new Prisoner DVD Digipack from copyright holders Granada Ventures, providing links to a number of websites selling and promoting the DVD (including pictures of the packaging of the DVD). Amazing that 2 months later Bruce Clark should add a picture of the packaging to his site and claim it to be "an exclusive image". "A recent discovery by Six of One has proved that the 1967 world television premiere of the series was actually in Canada - shortly before the UK airing! This is the kind of detective work that Six of One is famous for." This information can be found on page 140 of Rob Fairclough's Official Prisoner Companion Book, published several years before Six of One "discovered" this information. In a later mailout they included the following astounding statement in their magazine, in which they claim to members that Six of One are the only source of Prisoner events and articles! Astounding! A brief visit to The Unmutual Website will show that the above is not true. "Hi Simon, really the best way for you is to rejoin - there's an online facility now, linked from my website - and you can then put in a free ad for selling the camera, plus raise the other questions. We'd love to help! Regards,Bruce Clark"
Seems you have to be a current member for them to help, even when it is in their own interest. Shame. Please keep up the good work!" "I like many on your site am a ex member of Six of One. I have recently left although i've been reading your site for over a year now. Obviously i read your info on six of one but i made uo my own decision due to the terrible attitude i have found from the people who run it. A while ago iasked for your help on making a prisoner jacket, i also asked the same question from six of one. You kindly came back to me with a great list of info and i did make my own jacket and i used it for filming a birthday video for a sci fi website i write for. I received only this from six of one "We cant give you any advice, why dont you buy one from the shop". As of February 2015 , incorrect and misleading statements are still made on Six of One websites, Facebook pages, and in their literature (and on social media by members who have believed the spin sent to them by the Society leadership) with no sign of abatement.